Please, San Antonio & Melisande in Paris are two delightful novellas written by award-winnng authors about women who journey to Rome and Paris and find creativity, identity, love, and healing. 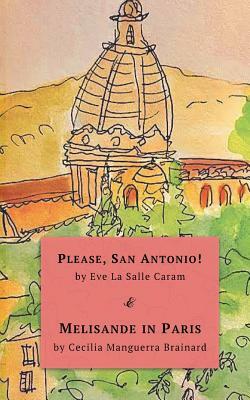 In Eve La Salle Caram's Please, San Antonio , an emotionally isolated American woman's trip to Rome becomes a powerful quest to find what she has lost: her creativity, identity, and "an open place in her heart." Together, Caram's Beatrice and Brainard's Melisande cross geographical borders and borders of the heart with vitality and spirit, and will inspire those who believe in the possibility of heaven on heart.